Mad Men, Twilight and The Hunger Games studio Lionsgate is expanding into video games. Movie studios and game development are shaky friends. Some, have been successful, like Warner Brothers Entertainment and its Batman series, while other studios have struggled to make their games divisions profitable. Disney Interactive cut 700 employees this March, though things are looking up given the strength of Disney Infinity, the combination video game and toy line. Announced April 30, Lionsgate is joining the competition with its own video game division. Peter Levin, former CEO and cofounder of Nerdist Industries, will be president of Lionsgate's new interactive ventures and games division. In an interview with GamesBeat, Levin says, "My goal is to put some unique partnerships and relationships together. You can't map one strategy in games across a portfolio of IP." Levin says that Lionsgate is considering several avenues for expanding into games, including investing in game startups, commissioning games from existing studios, and development of new properties. Levin is also considering all possible platforms for games based on Lionsgate's properties. "The engagement metrics are so phenomenal in mobile and tablets," says Levin. "Marrying that with great IP and a narrative could be a real interesting proposition, like what Kabam has done with (the mobile game for) The Hobbit." Lionsgate has a large catalog of franchises and other intellectual property that could be developed into games. Film properties include The Hunger Games and Twilight series, sci-fi thriller Divergent, The Expendables 2, The Possession, and Instructions Not Included, the highest-grossing Spanish-language film ever released in the US. 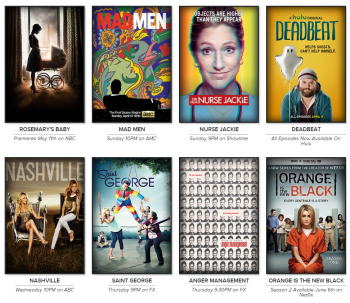 Television properties include the critically acclaimed Orange is the New Black, Emmy award winners Mad Men and Nurse Jackie, Weeds, and over thirty other shows. It's not known how many of Lionsgate's film and television properties have also signed over game rights. In June last year, Telltale founder Kevin Bruner said he would love to make a Mad Men game. Lionsgate has not announced any specific properties that it intends to pursue as video games. I wouldn't mind seeing something set in the Mad Men milieu, but its success would depend on the size of the intersection of gamers with lovers of advertising dramas. Maybe a mobile app where you mix drinks for Don Draper and he criticizes your choice of gin? What do you think, is there a Lionsgate game you'd love to see?